Our Surrey dentists consider Invisalign to be an ideal treatment option for adults. Here’s why. 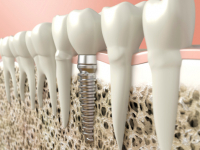 Dental implants and dental bridges are both replacement options for missing teeth. Our Delta dentists will take the following factors into consideration when prescribing either of these teeth replacement options. If you’re considering getting your teeth whitened, you may be wondering: how white is too white? Here are some tips for teeth whitening to help ensure you don’t go a step too far. During the first few days and weeks after you get new dentures, your mouth will need to adjust to your new appliance, and you’ll have to eat a soft diet for a while. Here are a few food suggestions to help you avoid getting bored! Providing sedation for patients with special needs fits well into our general practice philosophy: that it’s paramount that each of our patients receives the care he or she needs, safely and comfortably. Though they may seem similar, there are some important differences between sleep apnea and snoring. Here, our Surrey dentists explain how you can tell the difference. Though the risks associated with teeth whitening are relatively minimal, there are still some important factors our Surrey dentists want patients to consider when they are considering this cosmetic dental procedure.